What do those 1965 Mustang Data Plate Codes on your door jamb mean? Decoding these codes reveal important original equipment and paint code information on your 1965 Ford Mustang coupe, convertible or fastback. These letter and number codes show details on your Body Style, Exterior Color, Type of Trim (such as standard or pony interior ), Date of Manufacture, District Sales Office, Axle Ratio and Transmission type. When you are restoring a classic Ford Mustang, you may want to restore it to it's original color and interior, or you are looking to buy a completely restored Mustang and want to decode the data plate to ensure that the color on the car is true to the original, since you plan to enter it for judging in a Mustang show. This is where checking out your 1965 Mustang data plate codes can be invaluable. Over the years a previous owner may have changed the color or modified the interior to such an extent, that it's not possible to tell without some original information. Use this 1965 Mustang data plate decoder to find all the original specs for your car. The 1965 Mustang Data Plate Codes can also be used to piece together a new reproduction data plate if your is either damaged or missing. Many times this can happen if another door is used in crash repair, or you are restoring a car from a rusted or incomplete shell. If your data plate is damaged or lost, you can now replace it with a new reproduction data plate. 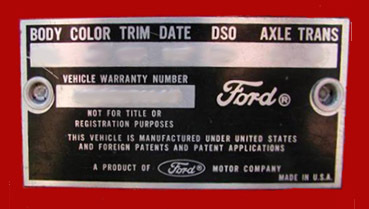 For about $30.00 you can send in your 1965 Mustang Data Plate Codes information and they will produce a new one for you. Most classic Mustang parts sellers offer original looking, reproduction hollow center rivets, just like the originals which can be gently tapped into place with a small hammer. Note: Although there are similarities between the model years, these codes differ from year to year, so if you are looking for date codes for your 1966 Mustang, you will need to search for 1966 Mustang data plate codes to properly decode your pony car.